Ideal to Remotely Monitoring and Recording Multiple PCs from One Central Location. Here are a few things some customers have had to say about our Realtime Spy when they have used it to remotely monitor multiple PCs. These testimonials are unedited - except for last names. Last names have been dropped for customer confidentiality and some customers have chosen to remain totally anonymous. thanks, all works now - you guys are great. I use this to monitor my kids Internet usage, Every parent should know about this. thanks again - your support team is wonderful. The Tech Support was outstanding! We requested help in the evening, and the answer was received shortly after midnight.Your product was recommneded on Fred Langa's Langalist. It is taking us seniors a little while to fully understand all of the features, but we are slowly getting it. 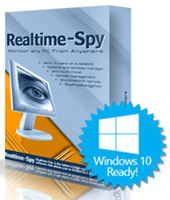 We have recommeded Realtime-Spy to two other parties. I will keep buying your upgrades cause you are the greatest support dude of any product I've ever used. Thank you for being so great. Keep up the good work. In this day and age of internet rip off scams it is refreshing to have done business with such a reputable company as yours. Thank you...I appreciate all your help since i purchased the software...you've been great in getting back to me with all my questions and because of that, I have recommended your product to many parents and friends. Thank you for your quick response! :) I have told my friends about your products. Thanks for a great product at a reasonable price - much less than other ones I checked into!!! Thank You very much for your assistance. You've been very helpful and I apologize for being such a menace requiring so much of assistance. But I will say this much about your program. It is everything that you advertise it to be and much more. I have found it extremely informational and have referred it to many of my friends including internet friends! I also find the program reasonably priced considering all that the program has to offer. I am sure that I will purchase more of your products in the future! Once again thank you very much! Every time I have had any questions or problems 1SpySoftware support has always been prompt and accurate with there response.They have never left any question or part of any question go unanswered. I would recomend this software to anyone with the need to monitor a computer. The software is great and the support is equal in quality. Thank you for your timely response, for 80 bucks, that is something i expect, and so far you guys are worth every penny and more. I beleive this is the best software I've seen for protecting your children and for peace of mind. I have been able to give proof that harrasment happened to my daughter from one in her class..
As a professional, i enjoyed alot installing this product. User guide is excelent and user friendly, and tech support is just great ! You did a great job, guys! 'you guys are the best! I tried another program first and you needed to be a computer engineer to use it!fast service, easy to use, highly recommend! Thanks for putting out such a great program -- I have no reservations about turning my kids loose on the net knowing that I can track their every move! It puts us parents back in the driver's seat when it comes to an otherwise scary place for our kids -- the Internet! I believe your product helped us keep our youngest off drugs. WE were right on top of what was going on. We do reccommend your product to our friends. Submit your own Realtime Spy testimonial. We'd love to hear about your experiences with our spy software products.